It still feels like summer at Clay and Limestone and there are only hints of autumn's fullness in the blooming goldenrod and false dragonhead. Most Nashvillians, including me, are inside keeping cool. But, my best garden helpers show up every morning at sunrise and work till sunset. You know I'm talking about the bees and butterflies who are bzzy pollinating our gardens while they move from flower to flower drinking nectar. The Lovable Bumbles are the hardest workers we could ever ask for in our gardens. They will visit the first dandelion in late winter and stay around till the last aster disappears in November. They're the major pollinators in my garden and in yours. Bumbles are generalists and don't require any specific plants. They will visit almost any nectar producer. So plant plenty of flowers to bloom over a long period of time. In my own garden in the Southeastern USA~I've planted a variety of mostly natives that bloom from spring till the first killing frost. Along with the goldenrods, asters and Physostegia virginiana; also blooming now are blue lobelia, heucheras, vernonias, fall blooming liatris, helinium, Tennessee Purple Coneflowers, agastache, a few wonderful annuals and some special exotics. bumblebees, moths, flies, beetles, butterflies, birds, and bats....and the tiniest little bees! The more diverse your flower planting, the more it can support resident pollinators. Then they can take care of your garden bzzness. PS A quick reminder! Wednesday, September 22, is Wildflower Wednesday~Hope you join in the wildflower celebration! If you want to hear BTO sing Taking Care of Business go here! We've been mostly indoors too. It sure seems like it should be cooler by now! Goldenrod is blooming here too. I need to get some ironweed integrated into the wild areas here. I've even noticed that the bumbles will visit different species while foraging. (Going directly from a Liatris to a coneflower.) I'm not sure how that helps pollination, but I sure do love to see them. 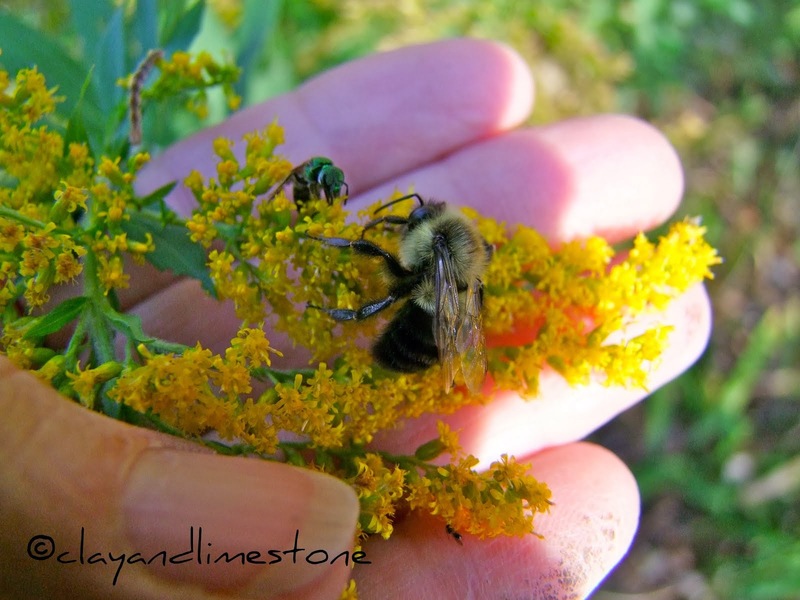 Stunning photos, Gail, and a bee-utiful reminder. I second Carol's thought on your garden being a banquet for bees and butterflies. I have a new found respect for anyone who gardens in the south - just back from Texas & I'm gobsmacked that anyone ever goes outside to water between February and November. As always fascinated to see we've got so many of the same flowers in bloom. Tomorrow should be a perfect day to go out to get some good wildflower shots. p.s. Randy Bachman of BTO lives on CBC radio - good show called Vinyl Cafe. So nice to see the old guy so bzzzzy. Linked back to your last Wildflower Wednesday post today. Still hot here but not as humid anymore, which is a godsend. Getting very dry though! The insects have loved the heat though. Pollinators galore! It is nice to have a variety of things for all of them. Those little green bees are gorgeous aren't they? I enjoyed seeing your beautiful bee photos. It's been enjoyable to watch the bumblebees continually working; it's like summer is never ending. Wonderful photos of all your bzzzy workers, Gail! If you're ever in this part of Illinois, I'll be sure to take you to the Pollinatarium; you would enjoy it. And you would be their hero! Do you know the name of that little butterfly in the last photo? I just had the same butterfly in my butterfly garden this past weekend here in Houston..and I had never noticed the species before. I'm afraid it won't be in many butterfly manuals due to it's earthy colors. Hoping you or some other butterfly expert knows. And yes, diversity of species is the hallmark of a healthy garden...makes it all worthwhile doesn't it? :-)Thanks. I have never figured out why Bumble Bees can look so unthreatening despite their size - must be their haphazard flying patterns and cuddly furriness. This has been a good year for insects in my garden. Interesting to see you are still having it hot over there - Autumn coolness is creeping in over here. OH mercy, it is hot here too. When will it end?? My poor garden is cooking as I type. Even the goldenrod in my garden hasn't quite opened. It just needs a little moisture and I think I will have loads of yellow blooms for the bzzzers. Gail, your goldenrod is beautiful. Love those bumbles and love having them around. 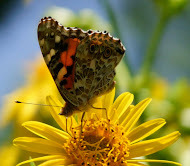 Did I tell you I saw a buckeye butterfly in my garden? I was so thrilled and I immediately thought of you and your buckeyes! Good reminder. I love the bumbles. What would we do without them, and you know, there is disease within their populations too? All because we loaned some queens to England. When they returned, they were sick. I think we should have just given them the queens for diversity in their populations. Remember a few years ago, when people were reporting a shortage of bees? My garden is still busy, too. Love the false turtlehead. One of my friends is sending me a plant. It should be in the dirt by tomorrow night. Hi Gail, I've noticed the bumbles hard at work in some of my gardens. Mostly for the wild plants. I call this certain plant a weed as it sure is a nuisance & spreads very easy. I don't know the name but it has small white/yellow center blooms. The stems break very easy.They have been mostly in my Asparagus Bed but are slowly coming up in other places. cost much to provide for them and they aren't very taxing at all. feature and that is ideal when mic will not be available. knowledge, possibly capturing images of you in compromising situation(s) and broadcasting it worldwide.